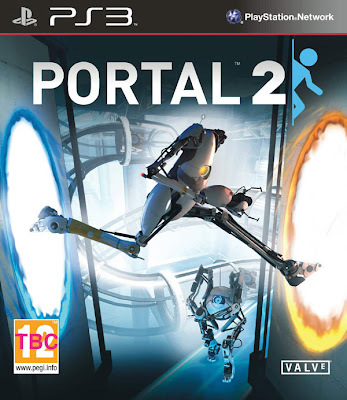 Portal was a rarity when it was released in 2007. Something new and half buried on The Orange Box it went onto become the game that everyone bought Valve's collection for. The sequel has been hotly anticipated, with a longer single player campaign and an added co-op mode for online play. Sadly at time of writing the latter has not been available because of the PSN network being down although XBox owners have been free to play to their hearts content. For the purists though this was always about how the single player would compare to the earlier title and although still not the longest game ever, Portal 2 engages like no other. As before you are the mute female from game one, dragged back to the testing laboratory. This time however, you have a companion of sorts in a small robot voiced by Stephen Merchant. He injects some humour (as you'd expect) and for the most part it works. He pops up from time to time as you progress through areas, occasionally pointing you in the right direction, but mostly just making you grin. The puzzling is the same as Portal. You carry a gun that fires two different energy bolts opening portals on walls, floors and ceilings. Step through one, pop out of the other. As before the learning curve is gentle, momentum slowly becoming more and more important and new liquids are introduced that can pass through the portals and change the nature of surfaces. The gentle narrative that develops throughout the game is delivered subtly, at times you barely notice it happening, but as compelling as the story is, the real winner is physics. Once you get to grips with how the game works there's immense satisfaction from figuring out how to complete a certain level. At times your dropping from a high ledge, firing a portal, shooting out of the other to a great hight and firing off another mid flight. And unlike the first game this never feels confusing. The puzzles don't feel quite as fiendish as the original but it is around twice as long with more variety in terms of environments and the type of puzzles. At times Portal 2 can feel quite a lonely plod through level after level. The disembodied voices of prerecorded messages are often your only companion and as a result the tight gameplay of the original is lost as Valve try and spin their story over a longer time frame. Loading times, especially early on as you move swiftly through the early tests, are trying and unforgivable in Portal's step up from side kick to big player. However Valve have delivered yet another quality product and if you fancy something a bit different, that you can play at your own pace, you can't go wrong with Portal 2.